Helicobacter pylori is a hardy spiral shaped bacterium which multiplies and colonizes in the stomach. H. pylori can survive gastric acids due to its ability to produce an enzyme called urease. Urease neutralizes stomach acid, making it easy for the bacteria to survive in it own acide-free zone. 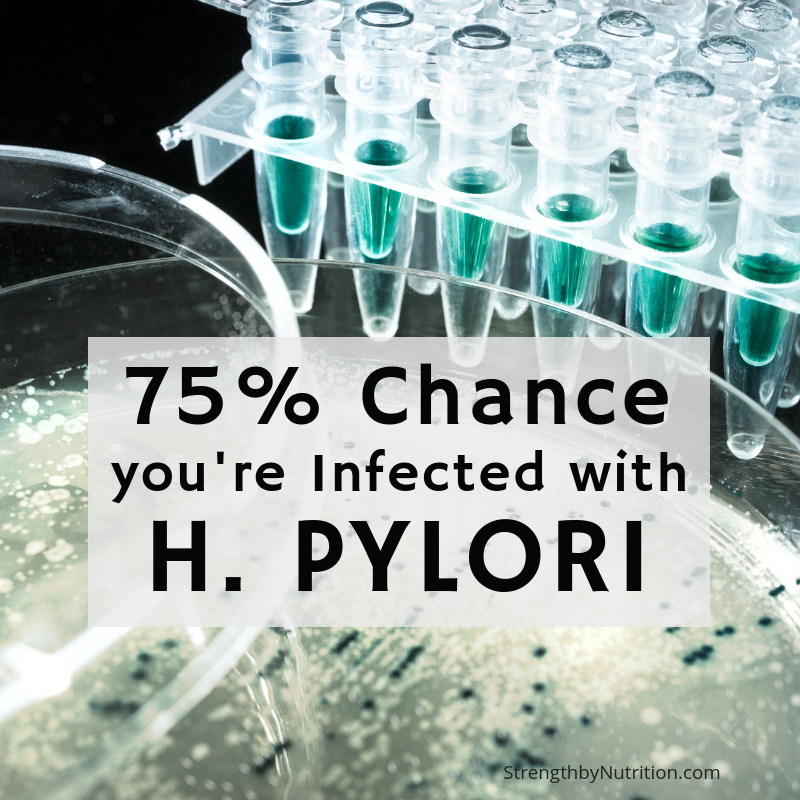 H. Pylori is the only bacterial organism that can survive in the hydrochloric acid in the stomach. The bacteria can easily penetrate the stomach’s protective mucous lining. It can even ‘trick’ the stomach into making more stomach acid which makes the stomach lining more susceptible to damage through exposure to acid and pepsin. This can cause stomach ulcers. -Almost 75% of the world’s population is infected with the H. pylori bacterium. That means over 4.6 billion people are infected worldwide. -Many patients treated with conventional antibiotic treatments find that they are still infected with H. Pylori and create another major problem – Candida Albicans overgrowth. -Over 50% of gastric cancer patients are infected with H. Pylori. -Research has found H.Pylori in the saliva of some infected people and can be spread by kissing. So treating multiple member in the family at once is important. A blood test checks for the presence of H. pylori antibodies, not for the bacteria itself. However it cannot differentiate between a past infection and a current infection. H. pylori antibodies may sometimes still be present in the blood for 12 – 18 months after a successful treatment. This means that you will test positive for antibodies when you are actually negative after receiving treatment. Blood Testing is considered to be the most INCONCLUSIVE test that can be used to determine if a treatment has been successful or not. Also known as the HPSA test. The stool antigen test checks to see if substances that trigger the immune system to fight a H. pylori infection (H. pylori antigens) are present in your feces (stool). This test is recommended BEFORE and AFTER you have been treated – it produces a very accurate result of your H. pylori status. I’ve used this test before and was very happy with the results. Unfortunately, the bacterium is not easy to eradicate. There is no single antibiotic that can do the job alone, so multiple antibiotics in conjunction with proton pump inhibitors (PPI’s) such as Nexium and Prilosec, are being prescribed – which come with a laundry list of side effects. It is important to look at clinically proven natural herbal solutions that can be done without any negative side-effect. Matula tea is a 100% natural product and can be taken safely with other medications. It contains clinically proven anti-bacterial, anti-fungal, and anti-parasitic properties that are proven to eradicate all strains of H. Pylori. According to Matulatea.com, Professor Patrick JD Bouic Ph.D from the Dept. of Medical Microbiology at the University of Stellenbosch did the laboratory “in-vitro” testing for Matula Tea and measured how effective Matula Herbal Tea proved itself to be in the eradication of H. pylori (click here for the extracts of Report & Laboratory results). His conclusion was that Matula Herbal Tea displays potent activity against the bacteria H. pylori, the main cause of stomach ulcers and gastric cancer. In fact the results are so conclusive that Professor Bouic has kindly given Matula Herbal Tea his personal endorsement (click here for Professor Bouic’s report and endorsement). Meaning, the study used two identically equal portions, one portion containing Helicobacter pylori bacterium and the other exact sized portion containing Matula. Inhibition is the amount of the bacterium that was killed off when the two portions are brought in contact with each other. As a result, the study found that Matula Herbal Tea is effective at killing off 93% of Helicobacter pylori each and every time that Matula comes into contact with Helicobacter pylori in your digestive system. If you extrapolate the effect of drinking Matula Herbal Tea twice daily (reccomended dose) where it’s effectively killing off 93% of the Helicobacter pylori with each dose, you can imagine that after 30 days (recommended length of ‘treatment’), there would be no chance of H. Pylori survival. • Regulates the production of stomach acids which promotes the healing of heartburn and reflux disease. • Aids to rebuild the protective mucous lining of the stomach. • Promotes the healing of damaged tissues. • Non-Toxic – it is as safe as a normal cup of herbal tea. Matulatea.com is one of the only providers for this tea. It is expensive, but worth it rather than going through multiple bouts of antibiotics and doctor visits. DRINK ON AN EMPTY STOMACH for best effect… Open sachet at the top, place sachet in a cup, pour boiling water and let it draw for a few minutes, when cooled down, enjoy! Taking Matula Tea is really easy, with a recommended dosage of just two cups of pleasant tasting tea per day for 30 days.  Processed tomato products: tomato sauce, paste or juice.  Garlic and onion- raw or in powder form – should be limited. We hope that this post brought awareness to the options available to you in your journey of eradicating H. pylori. We suggest working with a functional medicine practitioner to order labs before and after you decide to try a natural herbal remedy.